When professional dress makers and seamstresses need the highest quality zippers at extremely low everyday prices, they always pay a visit to The Zipper Lady. 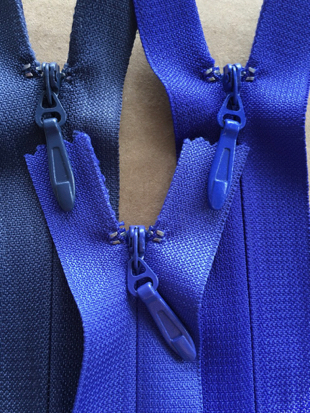 We carry an outstanding selection of invisible zippers, standard coil zippers, separating zippers and more, plus all the cords, needles and other workroom supplies you need to do a professional job every time. Click on any of our #6 finished invisible zippers below to order. If you don't see what you need, just give a call. Some manufacturers might call this a #5 invisible zipper. The #5 or #6 is 5mm or 6mm across the closed teeth. Width of the tape can be any width but our tape is 7/8". Special packaging options are available for your store. We are happy to work with you when designing your new line of bridal wear. #6 Sorbet Invisible - 30"
#6 Dusty Pink Invisible - 30"
#6 New Coral Invisible - 30"
#6 Orange Invisible - 30"
#6 Cobalt Invisible - 30"
#6 Dark Cobalt Invisible - 30"
#6 Navy Invisible - 30"
#6 Berry Invisible - 30"
#6 Silver Gray Invisible - 30"
#6 Sea Glass Invisible - 30"
#6 Mint Invisible - 30"
#6 Teal Invisible - 30"
#6 Turquoise Invisible - 30"
#6 Pumpkin Invisible - 30"
#6 Bright Red Invisible - 30"
#6 Denim Invisible - 30"
#6 Periwinkle Invisible - 30"
#6 Tan Invisible - 30"
#6 Brown Invisible - 30"
#6 Linen Invisible - 30"